Abandoned by his family, Enoch Bryant now lives in a rundown orphanage with other teenagers just like him. He loves his friends, even if the teachers are terrified of them. They're members of the rising plague generation. Each bearing their own extreme genetic mutation. The people in the nearby town hate Enoch, but he doesn't know why. He's never harmed anyone. Works hard and doesn't make trouble. He believes one day he'll be a respected man. But hatred dies hard. The tension between Enoch's world and those of the "normal" townspeople is ready to burst. And when a body is found, it may be the spark that ignites a horrifying revolution. 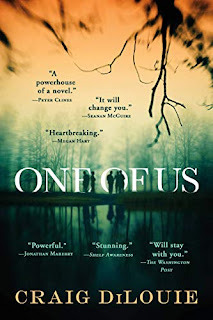 ONE OF US by Craig DiLouie is a very emotional drama set in 1984. The horror element is the way the characters treat each other: deplorable. I've often commented in my reviews about the definition of a monster...DiLouie wrote an entire novel about the debate over what defines a monster. As someone with a sociology degree, I can appreciate the academic and theological conflicts between the various groups. As a mother, I found myself often crying throughout the novel. I cannot fathom shunning children based on a genetic mutation, even though people do much worse over much less in real life. (I'm crying as I type this.) Brain's POV, particularly his birth experience, just about broke me. Parents refusing their own babies, putting them into Homes, where they are mistreated and sometimes tortured, is heart-wrenching. While reading, I felt so awful for the plague children who only wanted to be loved, but the concept is not a work of fiction, and that is the soul-crushing aspect. I felt something for all the characters. Whether it's the plague kids who just want friends and the freedom to make happy memories, the human kids who are trying to wrap their minds around the decisions of their parents' generation, or the people who continue to make everything worse on a daily basis, every single character has a depth to them. The sheriff is a great choice to use as the center of the story. Between his professional and personal experiences with the plague kids, he ties all the levels of the conflict together, helping both characters and readers make connections they might otherwise overlook. I'm sure this is a stand-alone novel, but I would not object to a sequel with the plague kids as adults. Not only do I recommend this book to fiction fans, but I would love to see One of Us become a part of recommended reading for libraries and schools as well.